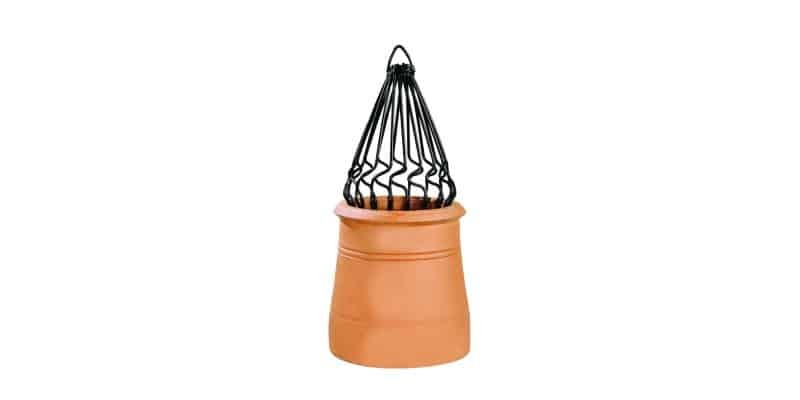 The Chimney Guard Pest Bird Deterrent System prevents jackdaws from entering chimneys for nesting and helps to prevent gulls from landing and perching on chimney pots. Depending on the construction of your chimney, you may find that it tends to attract a lot of pest birds. This is because the existing structure makes it easier for them to build a nest since the chimney presents a strong foundation for them to build upon. Jackdaws, in particular, tend to flock to chimneys wherever they can find them, but other species like wood pigeons, starlings, and even gulls may make their home in your chimney. This can pose a major health hazard, since their droppings and other debris may fall and block up the flue. If left unchecked, this could even cause dangerous carbon monoxide fumes inside your home- so it’s vital that you get the problem fixed as early as possible. The easiest way of keeping pest birds away from your chimney is by stopping them from landing in there in the first place. To do this, you will need a special chimney guard, such as the one shown above. This design will fit most standard-sized chimney pots and make it extremely difficult for any pest birds to get too comfortable on your chimney. The chimney guard is pushed inside the pot, where it is naturally held in place under the slight tension of the sprung steel construction. This means it doesn’t require any additional support fixings, so our professional pest control technicians can fit it for you quickly and easily. At Pest Solutions, we stock the chimney guard system in multiple sizes. Before we begin work, one of our surveyors will check the precise size of your chimney pot to ensure that we get things just right. Installing a chimney guard system won’t have any adverse effect on the normal function of the chimney, but it is remarkably effective in keeping pest birds at bay. You will never know that it is there, but jackdaws, pigeons, and other pest birds certainly will. When they see your chimney has been kitted out with a guard, they will know that they aren’t going to be able to get in here- so they will simply fly off somewhere else to roost or nest. Properly fitting a chimney guard deterrent is not something you should tackle on your own, though. Working at heights can be very dangerous, so it is better to let the professionals take care of things for you. Fortunately, the Pest Solutions team all have the necessary training and qualifications to carry out work at heights in a safe, adept manner. We also offer a wide range of additional pest bird control solutions, too, so you can be certain that we have the equipment needed to tackle even the largest infestations. To ensure that we perfectly meet your unique needs, we are pleased to offer completely free, no-obligation surveys to anyone interested in learning more about our services. Simply get in touch with us today, and we will happily arrange an appointment at a time that suits you. Not only will this survey show you first-hand the level of professionalism that we bring to every job, but it will also enable us to come up with the perfect solution to suit your pest control requirements. It may be the case that there is another option that might work better, or a chimney guard bird deterrent might only be one part of a larger strategy to deal with pest birds. Either way, we will let you know what we think is the best approach upfront, so there are no nasty surprises further down the line. Pest solutions have multiple local branches across the whole of the UK, meaning we can respond promptly to all calls. We know how distressing a pest problem can be, so we always carry out our work as quickly as possible without compromising on quality. That way, you can reclaim your property from pest birds, and have peace of mind that the problem is being dealt with properly. Don’t let pest birds pose a threat to your home or business. To have a member of our Pest Control service team carry out a FREE survey or a service visit today phone 0800 027 2555. Alternatively click here to find the details of your local Pest Solutions branch.